Managing Fatigue: Understand your batteries – Administration of Energy after Brain Injury. 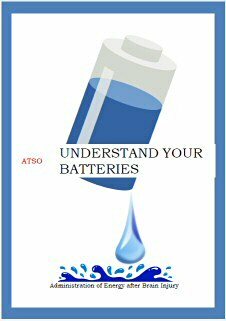 Understand your batteries – Administration of Energy after Brain Injury. This material provides a meta-cognitive approach to fatigue and energy management after brain injury. The material consists of two main sections: Knowledge and Tools. There are five tasks for patients to follow. Authors are occupational therapist Anne Petersen and speech therapist Mogens Vedel, from the Centre of Support Vejle, Denmark. The booklet is 20 pages in color and can be downloaded for £10.